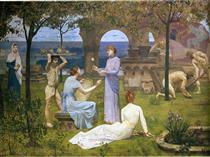 Pierre Puvis de Chavannes (14 December 1824 – 24 October 1898) was a French painter best known for his mural painting, who came to be known as 'the painter for France'. 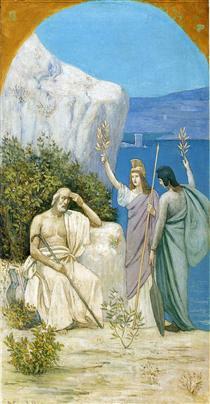 He became the co-founder and president of the Société Nationale des Beaux-Arts, and his work influenced many other artists, notably Robert Genin. 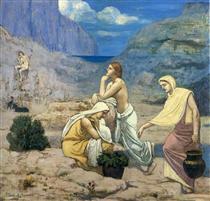 Puvis de Chavannes was a prominent painter in the early Third Republic. 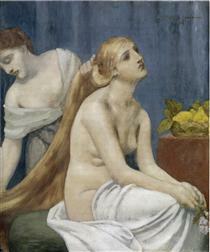 Émile Zola described his work as "an art made of reason, passion, and will". 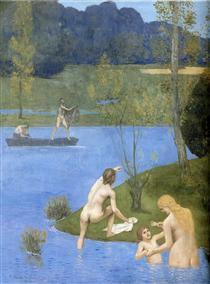 Puvis de Chavannes was born Pierre-Cécile Puvis in a suburb of Lyon, France. He was the son of a mining engineer. 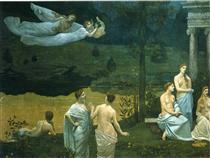 Being descended from an old noble family of Burgundy, he later added the ancestral 'de Chavannes' to his name. Throughout his life, however, he spurned his Lyon origins, preferring to identify himself with the 'strong' blood of the Burgundians, where his father originated. 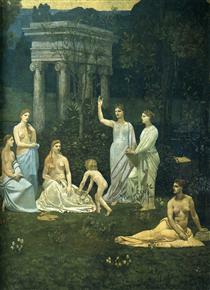 Puvis de Chavannes was educated at the Amiens College and at the Lycée Henri IV in Paris. He intended to follow his father's profession until a serious illness compelled him to convalesce at Mâcon with his brother and sister-in-law in 1844 and 1845, interrupting his studies. A journey to Italy opened his mind to fresh ideas, and on his return to Paris in 1846 he announced his intention to become a painter. He studied first under Eugène Delacroix, but only very briefly, as Delacroix closed his studio shortly afterwards due to ill health. 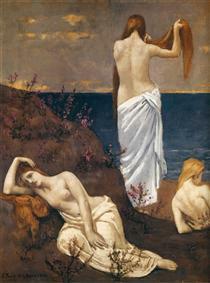 He studied subsequently under Henri Scheffer and then Thomas Couture. 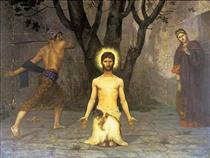 His training was not classical as he found that he preferred to work alone. 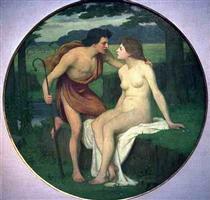 He took a large studio near the Gare de Lyon and attended anatomy classes at the Académie des Beaux Arts. 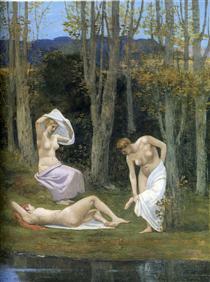 It was not until a number of years later, when the government of France acquired one of his works, that he gained wide recognition. 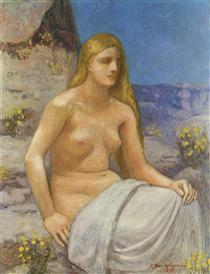 Puvis de Chavannes' work is seen as symbolist in nature, even though he studied with some of the romanticists, and he is credited with influencing an entire generation of painters and sculptors, particularly the works of the Modernists. 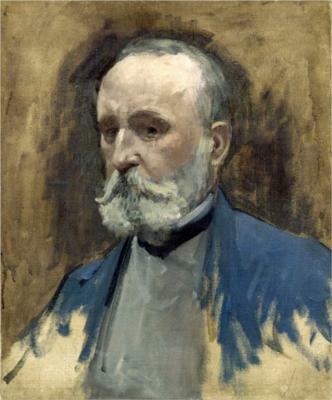 One of his protégés was Georges de Feure. 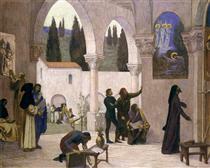 Puvis de Chavannes is best known for his mural painting, and came to be known as 'the painter for France.' His first commission was for his brother's chateau, Le Brouchy, a medieval-style structure near Cuiseaux in Saône-et-Loire. The principal decorations take the four seasons as their theme. 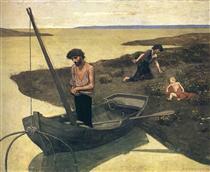 His first public commissions came early in the 1860s, with work at the Musée de Picardie at Amiens. 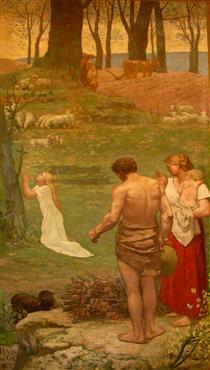 The first four works were Concordia (1861), Bellum (1861), Le Travail (Work; 1863) and Le Repos (Rest; 1863). 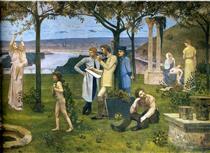 St. Genevieve as a Child in Prayer Pierre Puvis de Chavannes ?